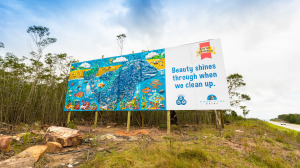 Woodlands Dairy has partnered with the Colours of You SA (COYSA) collective with the aim of turning 'trash' into a piece of art to communicate and highlight the beauty that comes from cleaning up. The artwork forms part of a billboard on the R303 as motorists leave the N2 and enter Humansdorp, and is part of Woodlands Dairy's 'Clean up your hood for good' campaign. "We wanted to involve local creatives to help us drive awareness about the benefits of cleaning up their neighbourhood," says Woodlands Dairy/First Choice GM: sales and marketing, Tinus Pretorius. "We need to get the public’s attention when it comes to littering, and what better way they to use the rubbish that's thrown away. It also gives people a taste of the amazing work from the Port Elizabeth arts community," Pretorius says. According to Woodlands Dairy, the billboard forms a visual representation of how much beauty people can add to their surroundings if they just gave it a little care. It is Woodlands Dairy and COYSA's hope that the public can become more environmentally aware and be inspired to do their part in cleaning up their hood for good; whether through recycling or getting creative. Gerard Addison (art director/graphic designer) and Zinzi May (art director/graphic designer) from COYSA spearheaded the project and partnered with some of Nelson Mandela Bay’s creative minds: Jonathan van der Walt (sculptor) and Sarah Walmsley (sculptor). Both van der Walt and Walmsley specialise in figurative sculptures using bronze, resin and glass, and Robyn Munnick (an artist) creates multi-model paintings that form an installation. "Thanks to the vast size of the billboard, we were able to experiment with the recognisable aesthetic of rubbish and use its texture, colour and scale," says the team at the COYSA collective. "We're grateful to have been given this opportunity, and its great to be part of a campaign to prevent future pollution as well as providing us with creative ammunition to convey this powerful message and demonstrate the environmental frustration that exists." For more information, visit www.woodlandsdairy.co.za. You can also follow Woodlands Dairy on Facebook.